A very full EUROTRASH Thursday: The build up to Sunday's Ronde van Vlaanderen started with the Dwars door Vlaanderen on Wednesday - report, result and video, plus stage 1 of the Giro di Sicilia. Chris Froome doesn't think a rider salary cap is a good idea - Top Story. Teams for Flanders, medical updates on Fabio Aru and Warren Barguil, Lefevere prefers Van der Poel, Lance Armstrong received a million for TDU ride, Esteban Chaves to ride the Giro, Cycling Stars Criterium, Deutschland Tour route, Tour of the Alps sponsor, Durham in the OVO Energy Tour Series, contract renew for Søren Kragh Andersen and Victor Campenaerts hour record part 5. Coffee? Should there be a rider salary ceiling in cycling? UCI chairman David Lappartient has been working on the idea, but there are mixed feelings amongst the riders. Vincenzo Nibali is in favor, but Chris Froome is against. "This way teams cannot profit from success," the six-time Grand Tour winner said to Spanish newspaper El Mundo. Unsurprisingly, Froome is against the caping of rider salaries, as he is part of the richest team in the peloton; Team Sky. Rumor has it that the budget of the replacement for Team Sky, Team INEOS, will €47 million, around $53 million. Nibali spoke about the dominance of Team Sky: "They are disrupting the market. To ensure that teams are on a more equal footing financially, a salary ceiling may be an option." Lappartient agreed with the idea: "We are thinking about a salary ceiling, whereby we draw a limit on how much money teams can spend." 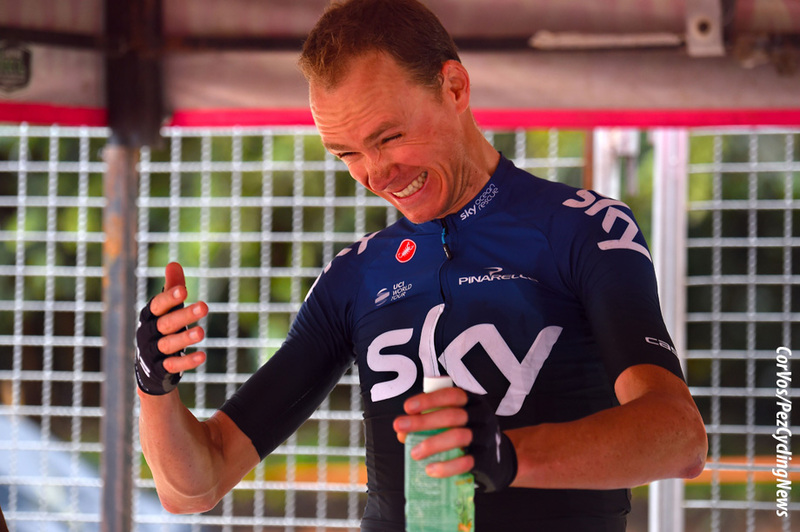 According to Spears, Chris Froome has an estimated net worth of £11 million and an annual salary of £3 million. Froome thinks it is a bad idea: "That goes against having success, we now have the largest budget, but it has not always been that way. When we started in 2010, we were certainly not the biggest team. However, we were successful, which means that you can also grow as a team. I would be sorry if teams could no longer grow by achieving success." It didn't take long for Mathieu van der Poel (Corendon-Circus) to take his first win in the WorldTour. In only his second start in a race on the top rung of the UCI ladder, the Dutch champion out-sprinted an escape group of five for the win ahead of Anthony Turgis of Direct Energie. Bob Jungels (Deceuninck - Quick-Step) took the third step on the podium. Under a blue and sunny sky, the Dwars door Vlaanderen peloton rolled out of Roeselare on Wednesday morning for a 182.8km-long loop through the Flemish countryside which concluded in nearby Waregem, but only after the riders took on twelve hills and three cobblestone segments that made for another spectacular and frantic race. WorldTeam Ranking leader Deceuninck – Quick-Step again took responsibility and controlled things behind the escapees: Jonas Koch (CCC), Nelson Oliveira (Movistar), Ramon Sinkeldam (Groupama-FDJ), Zhandos Bizhigitov (Astana), Lukas Pöstlberger (Bora-Hansgrohe), Michael Hepburn (Mitchelton-Scott), Kris Boeckmans (Vital Concept-B&B Hotel) and Mihkel Raim (Israel Cycling Academy). 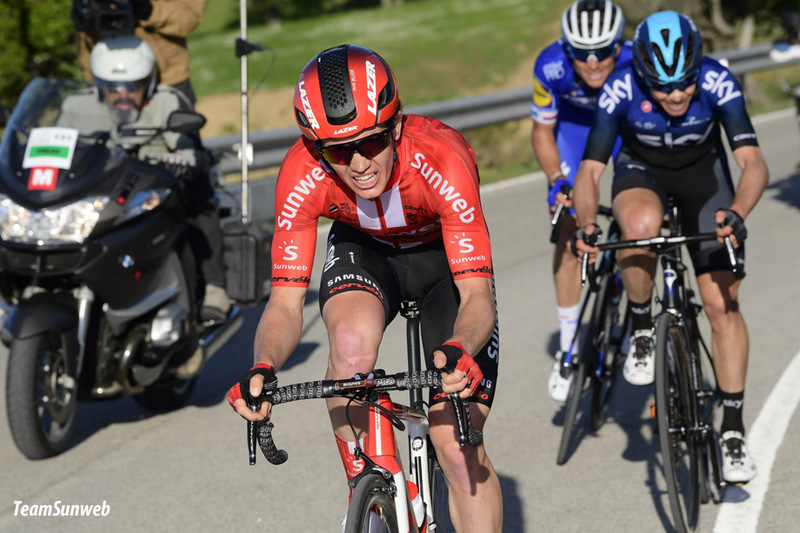 The Knokteberg was were the decisive move off the day took off, when Bob Jungels (Deceuninck - Quick-Step) responded to an attack of Tiesj Benoot (Lotto-Soudal), which saw the duo bridge to a strong group that was already up the road. Another selection took place, leaving just five men in the lead: Pöstlberger Van der Poel, Turgis, Benoot and Jungels. 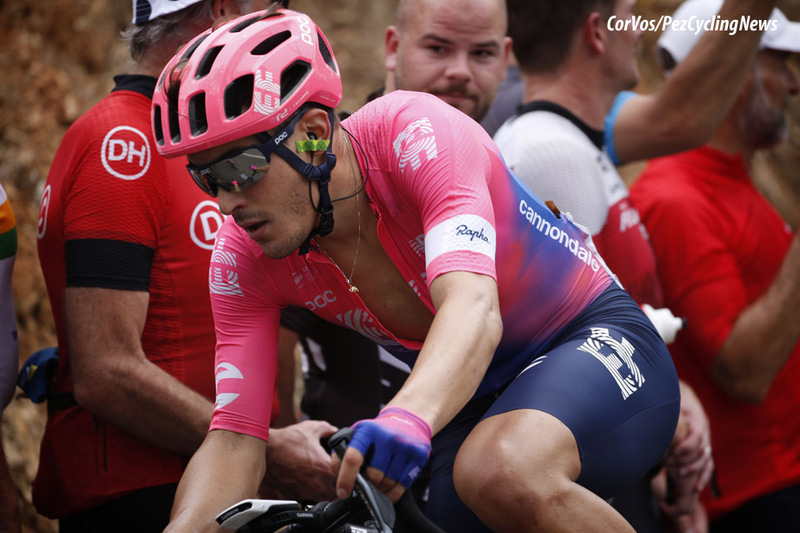 Despite not having the numbers on their side in the fight with the bunch, the quintet cooperated well and plugged away with just three climbs still left on the course. One minute separated the attackers from the chasers as they rode under the 10km-to-go banner, making it more and more clear that the winner of the 74th edition would emerge from the front group. 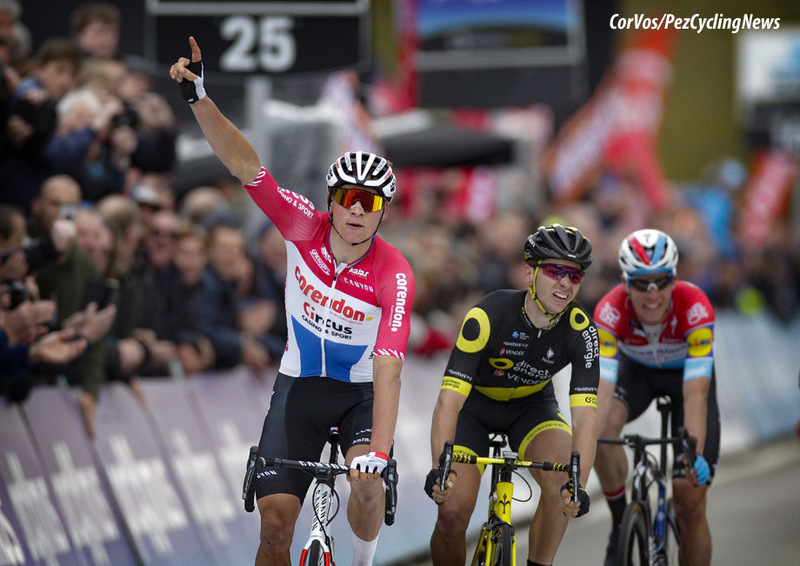 Bob Jungels tried to break clear, but was countered by the others, and the race eventually came down to a five-up sprint, from which Mathieu van der Poel emerged victorious. Race winner, Mathieu van der Poel (Corendon-Circus): "That was a bit of an instinct moment. Dries De Bondt from our team was sent ahead. Iván García responded and I slipped along with him. Dries soon broke his rear wheel, which was a pity. But I think it was a good time to anticipate. It was especially important to make sure that no one left the last kilometers. We did that well. We immediately counter-attacked the boys who attacked. In the sprint I turned around just in time, when Turgis came from the side. Then I immediately felt that I had another sprint in my legs. I am very happy to finish it here! I don't think this can really be compared to the Tour of Flanders. It is of course a very difficult game. But it is "only" 180 kilometers and that is nearly a hundred fewer than in De Ronde. We shall see. I don't see myself as a favorite, at least." 3rd, Bob Jungels (Deceuninck - Quick-Step): "Iljo, Alvaro and Florian rode a strong race, controlling the breakaway and cutting into the gap, which allowed me to make that move on the Knokteberg together with Tiesj and come across. I don’t want to say that the race was too easy, but the final didn’t play into my favor, as there was no real moment where I could make the difference. In the sprint I didn’t have a chance against those guys, but third is a good result, as it’s always nice to be on the podium, especially in a race with such a history and during which I felt good, which bodes quite well for Flanders." 4th, Lukas Pöstlberger (Bora-Hansgrohe): "Today I felt good. I rode at the front of the race for a long time, and in the end, I waited for the final sprint. In hindsight, I should have probably put in an attack in the last kilometer, because I think I would have had a better chance if I had done that. Earlier, the race was also neutralized. That was a shame, because it took a significant amount of work to make it into the breakaway, and the interruption disrupted the rhythm somewhat." 5th, Tiesj Benoot (Lotto Soudal): "I have mixed feelings after this race. I am happy about my shape, as I was during the past Classics. It is just a pity that the results are not alike. A fifth place is not what I aimed for today. I wanted a podium spot and unfortunately, that did not work out. I was in the lead of the race on the right moment together with riders like Jungels and van der Poel. It was certainly not easy to attack, because there was a tough headwind in the final kilometers towards the finish. I waited as long as possible and eventually I was the only one who attempted to get away. When I launched my attack, I was surprised that it was Jungels who caught me back. I speculated that van der Poel would have to take the initiative. Then I realized it would be extremely difficult for me in a five-rider sprint. I am satisfied with my shape at the moment and with my performance, but in the end a bit disappointed about the result. Towards the Tour of Flanders, this is a confirmation of my great shape. The fact that this race is 267 kilometers, is to my advantage. I am surely looking forward to it." 10. Heinrich Haussler (Aus) Bahrain-Merida. 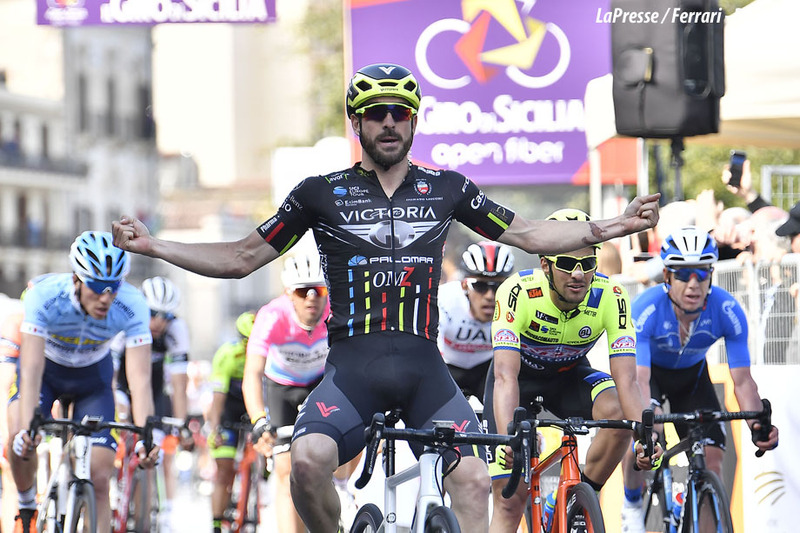 The first bunch sprint of Il Giro di Sicilia crowns Riccardo Stacchiotti (Giotti Victoria-Palomar) ahead of Manuel Belletti (Androni Sidermec) and Luca Pacioni (Neri Sottoli-Selle Italia-KTM), with Stacchiotti also becoming the first leader of the General Classification. The first part of Stage 1 was animated by a long breakaway by Krister Hagen, who went on the attack after 15km along with five other riders, then remained in a solo lead until when there were just over 15km to the finish line. Then it was Androni Sidermec who took control of the race by facing the last few kilometers in the leading positions to launch the sprinter Manuel Belletti but in the last 30 meters Stacchiotti overtook Belletti and raised his arms on Milazzo's finish line. The stage winner and first Maglia Rossa e Gialla, Riccardo Stacchiotti: "Getting the first victory of my career on Italian soil in this important race is really fantastic! The stage was tough from the start and I have to thank the team that brought me in the ideal position to do my best effort in the sprint. In the finale I followed the right wheel, Belletti, and I gave it my all. Every time I ride my bike or win a race I always think of Michele Scarponi. He taught me so much, not just as a rider but above all as a man. I am from Recanati, a village near Michele's, and we often saw each other outside the races. I always like to remember him, especially on an occasion like this." The Maglia Verde Pistacchio (pistacchio green), Isaac Canton Serrano (Kometa Cycling Team): "I want to thank everyone for this jersey, especially Basso and Contador who are here in Sicily. I'm very happy, it's a great start for the whole team and being here today on the podium with Basso and Contador is a dream for me. We will try to do our best for the next few days and fight for the General Classification." The Maglia Bianca (white), Juan Sebastián Molano Benavides (UAE Team Emirates): "The team did a great job today but in the end I made a small mistake, I can't be satisfied, not at all! I have to learn what happened and continue to improve. I hope to do better in the coming days." 10. Colin Joyce (US) Rally UHC Cycling. 10. Damiano Cima (Ita) Nippo-Vini Fantini-Faizanè. 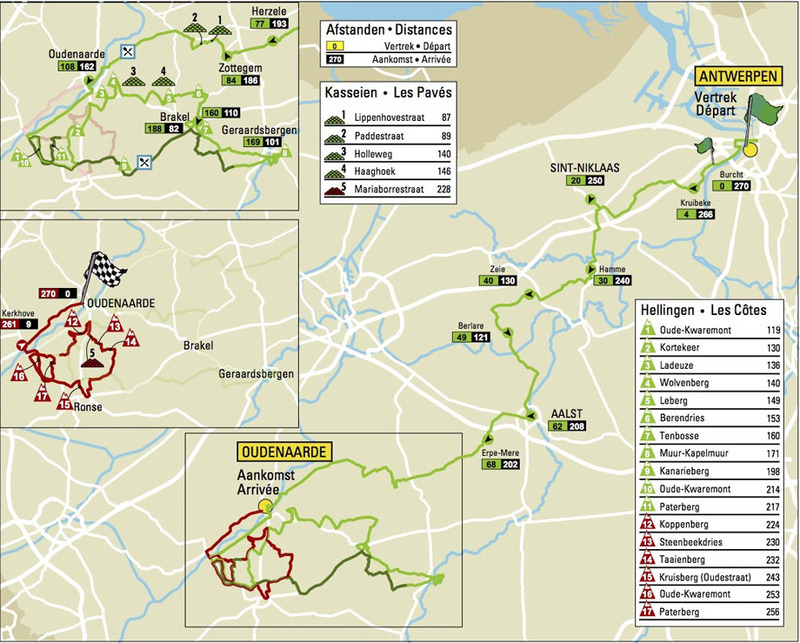 This Sunday, the Tour of Flanders will hit the cobbles and Muurs with an open and hard race. Here are the first team announcement, more will be added in the run-up to the race start. See the PEZ Flanders'19 Preview HERE. With Zdeněk Štybar and Bob Jungels, Deceuninck-Quick Step has two big contenders for the Tour of Flanders. Philippe Gilbert is also in the team after he had to stop in Dwars door Vlaanderen with stomach problems. Štybar was able to show himself during the opening weekend by adding Omloop Het Nieuwsblad to his palmarès. 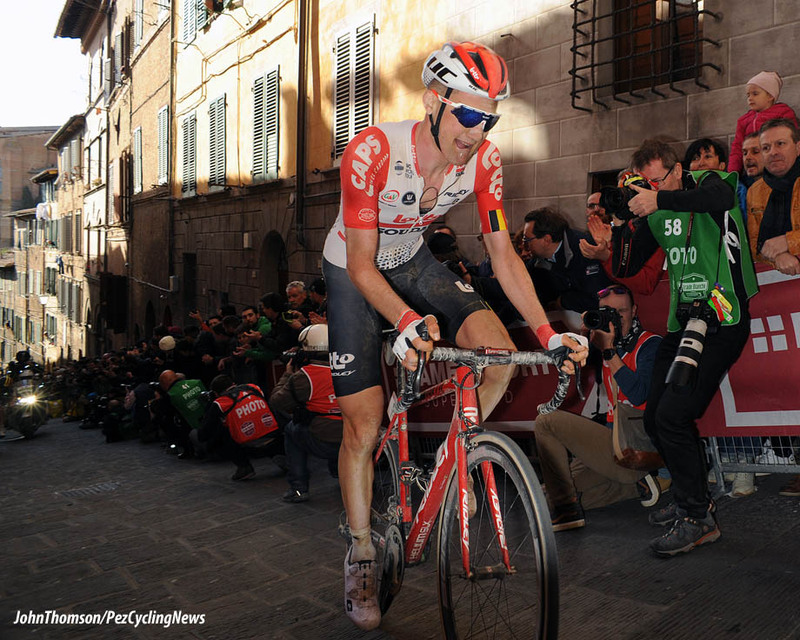 He also finished 4th in Strade Bianche. Last Friday he was again the best in the E3 BinckBank Classic. "I did everything to be ready for Sunday, I’m happy to be regarded as one of the big contenders and I hope the race will go well and luck will be on our side. It’s not just one of the most important races of the season, but also a personal favorite for our team and we are confident and motivated to keep it rolling for the Wolfpack." 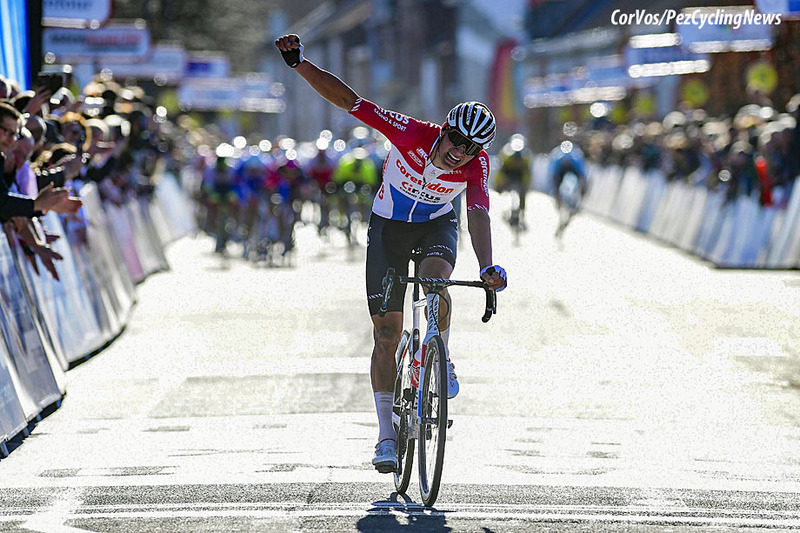 Bob Jungels was one of the cobbled Classics’ strongest and most impressive performers, riding to a great win at Kuurne-Brussels-Kuurne and finishing third at Dwars door Vlaanderen, as well as setting up teammate Zdenek Stybar for victory in E3 Harelbeke. "Being at this level before Flanders gives me a lot of satisfaction, because it means I’ve had a very good winter and a nice preparation in Colombia. It will be my first time in the Ronde and I’m proud to be here with these guys and really honored to be named among the favorites, but what really matters in the end is what we’ll do during the race, for which we are prepared", said Bob, who’ll make his final appearance at the Classics before going on an altitude training camp for the Giro d’Italia. Philippe Gilbert is also in the selection. The winner of 2017 had to abandon Dwars door Vlaanderen due to stomach problems. "Of course, it’s not the best preparation to get sick ahead of a big goal, but I hope it will still be possible to do something. As you can see, our roster is a strong one, comprising many talented riders who can make the difference. We have to ride smart again and count on several riders in the final, because having the numbers is always the best situation you can find yourself in." Also on Deceuninck – Quick-Step team’s for Sunday will be Kasper Asgreen, Tim Declercq, Iljo Keisse and Yves Lampaert, for whom riding Ronde van Vlaanderen with the Belgian Champion jersey on his shoulders; "will be a special feeling and I’m ready to enjoy every single moment of the race". Kasper Asgreen (Den), Tim Declercq (Bel), Philippe Gilbert (Bel), Bob Jungels (Lux), Iljo Keisse (Bel), Yves Lampaert (Bel), Zdeněk Štybar (CZ). 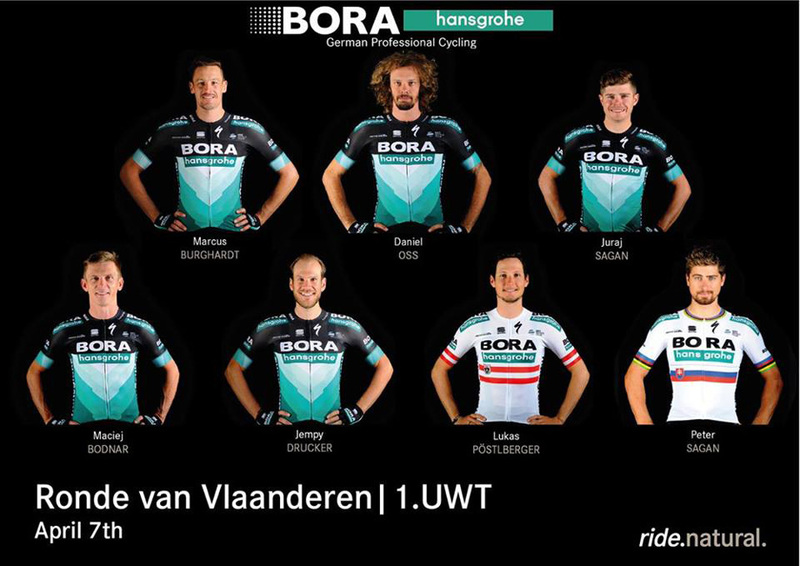 Bora-Hansgrohe has picked their team for the Tour of Flanders. The German formation naturally starts with Peter Sagan. The former winner is the obvious leader for next Sunday. The Slovak relies on experienced classic riders such as Daniel Oss and Marcus Burghardt. The winner of 2016 Ronde fell ill during the week before Tirreno-Adriatico. The triple world champion, however, recovered well and finished fourth in Milan-San Remo. Sagan made a lesser impression in the E3 BinckBank Classic. The 29-year-old rider then rode a very offensive Gent-Wevelgem, but he did not compete for the win. Next Sunday we will know if Sagan is good enough to win the Ronda for a second time. He will be helped by two experienced riders; Oss and Burghardt. Bora-Hansgrohe also counts on Lukas Pöstlberger who was 4th in the Dwars door Vlaanderen. Juraj Sagan, Maciej Bodnar and Andreas Schillinger are also in the selection. The latter replaces Jempy Drucker. The 32-year-old rider fell heavily in the final sprint of Dwars door Vlaanderen. Drucker suffered a concussion and a broken neck vertebra. This is a loss for Sagan and co, since the Luxembourger was in good shape. Maciej Bodnar (Pol), Marcus Burghardt (Ger), Daniel Oss (Ita), Lukas Pöstlberger (Aut), Juraj Sagan (Slo), Peter Sagan (Slo), Andreas Schillinger (Ger). 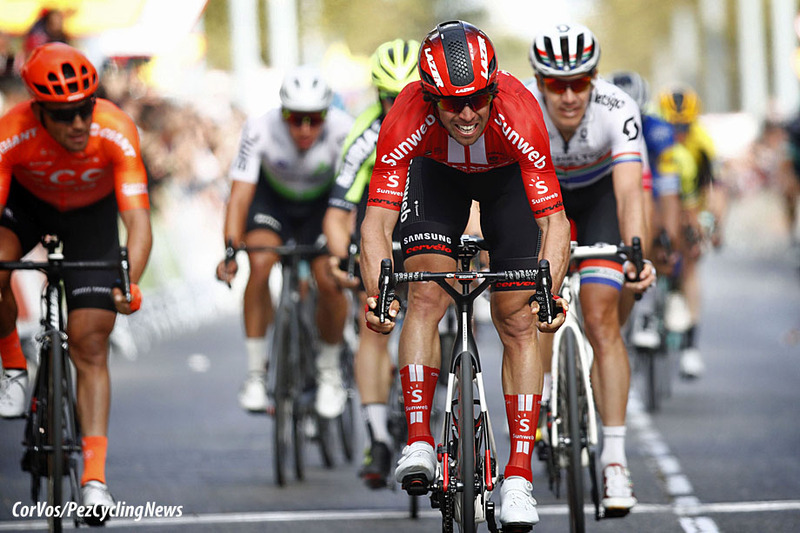 Marc Reef - Team Sunweb coach: "Ronde van Vlaanderen is the highlight of the Flemish spring classic season and it is a special race that both the peloton and the fans have been building towards. Michael, who makes his debut at the race, will be our leader on the day. In Catalunya he showed that his form is on the up and he has good legs, winning two stages and the points jersey. We bring a strong squad to support him deep into the race and set him up for a good result." Asbjørn Kragh Andersen (DEN), Søren Kragh Andersen (DEN), Nikias Arndt (GER), Cees Bol (NED), Roy Curvers (NED), Michael Matthews (AUS), Casper Pedersen (DEN). 2015 winner Kristoff, Gaviria and Philpsen to debut. The team’s men will for glory in the Ronde van Vlaanderen (also known as Tour of Flanders) on Sunday, April 7. The race starts in Antwerp and finishes in Oudenaarde: 267km, 17 bergs, and plenty of cobbles. The Tour of Flanders will see the rainbow jersey of the World champion on Sunday. 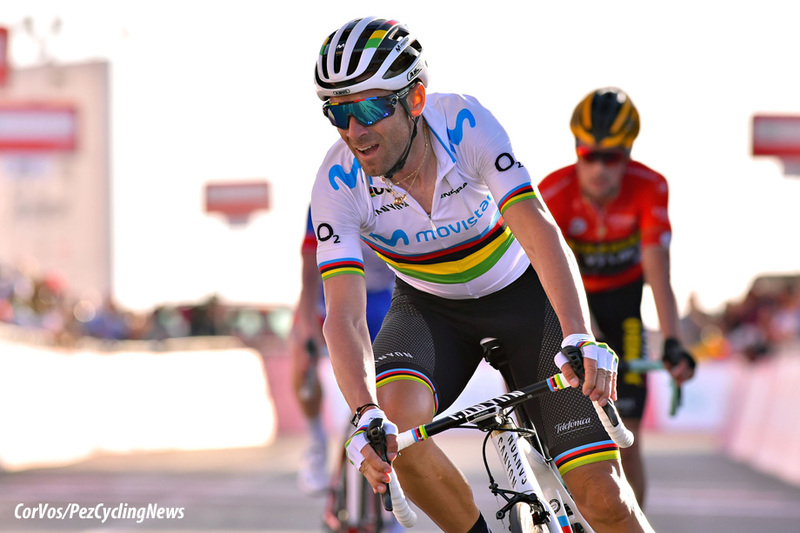 Alejandro Valverde will lead the Spanish Movistar team backed by strong riders like Jürgen Roelandts and Jasha Sütterlin. Valverde rode the Dwars door Vlaanderen last Wednesday to finish 31st in Waregem. The Spaniard will make his debut in the Tour of Flanders on Sunday. "We assume that he will be good on Sunday, even though he is not in top form," Movistar team DS Vicente García Acosta commented. Valverde has a strong team to count on: There is the 33-year-old Roelandts, who was 3rd in Flanders six years ago. Sütterlin also made a good impression in the E3 BinckBank Classic, while the Portuguese Nelson Oliveira rode strongly in Dwars door Vlaanderen. Imanol Erviti also knows what to do. The 35-year-old rider finished 7th in 2016. Jaime Castrillo and Lluís Mas fill the team selection. "I am curious how Valverde will perform in Flanders. I think he's going to do well. I will try to give him some tips," says Roelandts. Jaime Castrillo (Spa), Imanol Erviti (Spa), Jürgen Roelandts (Bel), Lluís Mas (Spa), Nelson Oliveira (Por), Jasha Sütterlin (Ger), Alejandro Valverde (Spa). 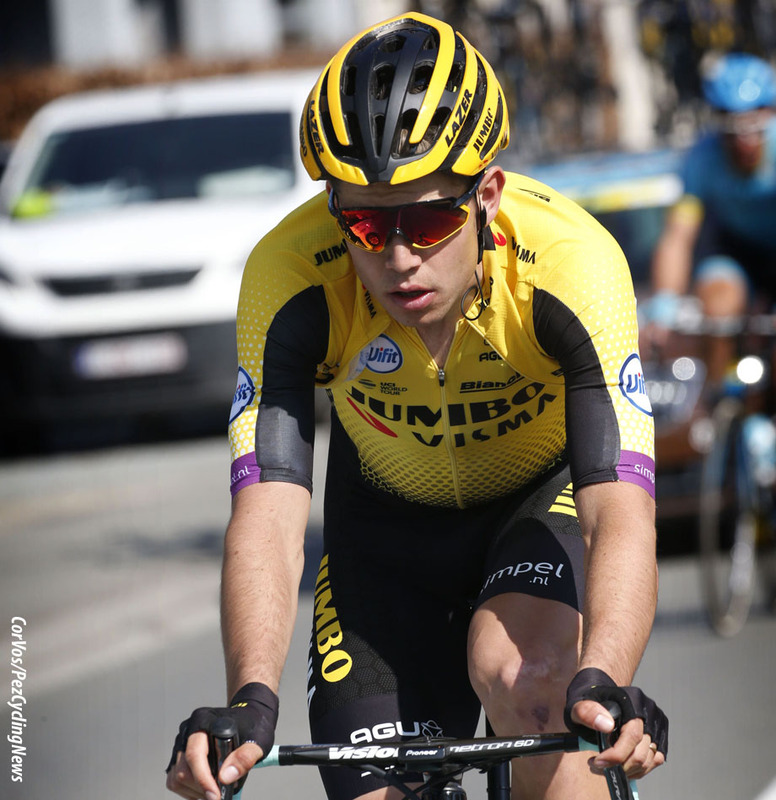 Jumbo-Visma has announced the seven riders that will be at the start of the Tour of Flanders on Sunday. Wout van Aert is the leader of the Dutch formation, the rest of the team is the same riders as Gent-Wevelgem and the E3 BinckBank Classic. Van Aert made his debut last season with a 9th place in Flanders. This year's Spring Classics he has taken podium places in Strade Bianche and the E3 BinckBank Classic. The Belgian set the pace last weekend in Ghent-Wevelgem on the first passage of the Kemmelberg, where only Zdeněk Štybar could follow. Van Aert also has fellow countryman in the selection with Maarten Wynants, plus four Dutchmen: Pascal Eenkhoorn, Taco van der Hoorn, Danny van Poppel and Mike Teunissen. The Norwegian Amund Grøndahl Jansen completes the team. Wout van Aert (Bel), Pascal Eenkhoorn (Ned), Amund Grøndahl Jansen (Nor), Taco van der Hoorn (Ned), Danny van Poppel (Ned), Mike Teunissen (Ned), Maarten Wynants (Bel). Roompot-Charles has revealed which seven riders the team will be starting the Tour of Flanders on Sunday. With eight participations and his 6th place in 2015, Lars Boom is the most experienced name on the list. Although Roompot-Charles did not know how to win in 2019, the team did take a few places of honor in recent weeks. 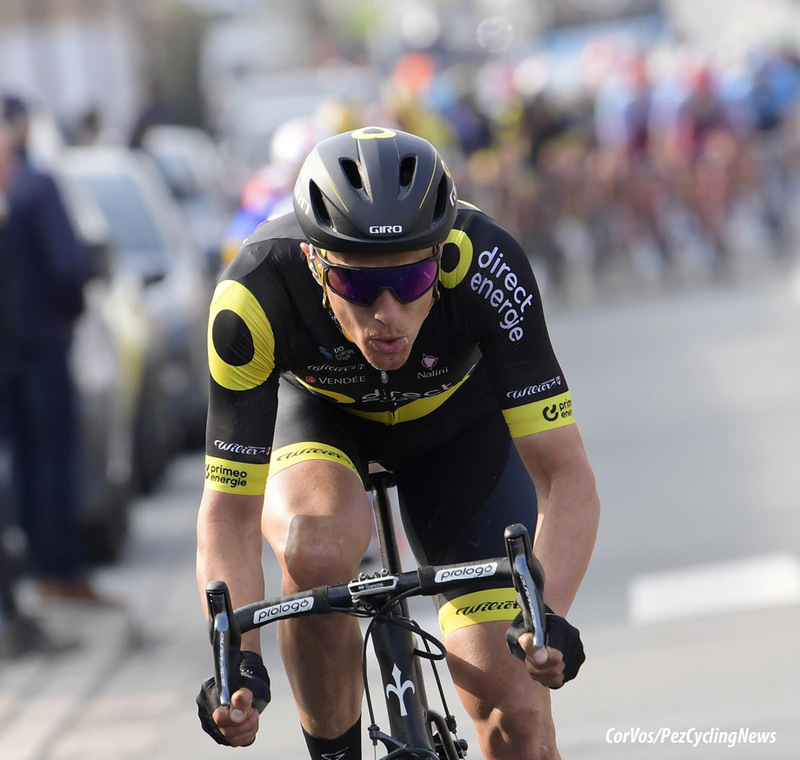 Pieter Weening finished fifth in the Classic de l’Ardèche and Lars Boom and Boy van Poppel placed fourth in Le Samyn and Nokere Koerse respectively. These three riders will be there again on Sunday. Jesper Asselman, Sjoerd van Ginneken, Senne Leysen and Stijn Steels complete the selection. Elmar Reinders saw a possible participation in the Ronde go due to inflammation in his hand, which he had from a fall in the Ronde van Drenthe. 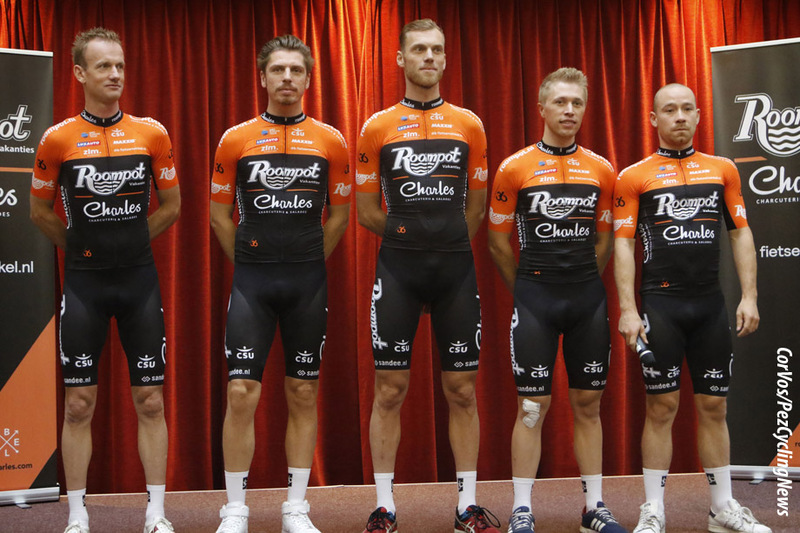 Roompot-Charles is one of the seven teams that received a wild card for the Flemish classic. Jesper Asselman (Ned), Lars Boom (Ned), Sjoerd van Ginneken (Ned), Senne Leysen (Bel), Boy van Poppel (Ned), Stijn Steels (Bel), Pieter Weening (Ned). Gianni Vermeersch has his wish to ride the Tour of Flanders fulfilled. The cyclo-cross rider, who recently assisted his leader Mathieu van der Poel in Gent-Wevelgem, is part of the seven man Corendon-Circus team. Initially it did not look like Vermeersch would be picked for De Ronde, but due to his strong performance in Gent-Wevelgem he was selected. "I have been selected for the Brabantse Pijl and the Amstel Gold Race. I can be of help to Mathieu there," Vermeersch explained to Dutch website WielerFlits. "I hope for the Tour of Flanders, but I do not know if I will be fresh at the start of the following races." In addition to Vermeersch, Van der Poel also has Dries De Bondt, two-time winner Stijn Devolder, Lasse Norman Hansen, Roy Jans and Otto Vergaerde by his side. Dries De Bondt (Bel), Stijn Devolder (Bel), Lasse Norman Hansen (Den), Roy Jans (Bel), Mathieu van der Poel (Ned), Otto Vergaerde (Bel), Gianni Vermeersch (Bel). Can Mathieu take the big win? "Every year, I line up at the Tour of Flanders saying the same thing. I’m strong, I’m confident in my form, and I’m motivated to win. Nothing has changed this year. I know I’m capable of winning the Tour of Flanders but it hasn’t happened yet in my career. I hope to change that on Sunday. The Classics are unpredictable so everything has to go your way. If everything goes my way then I’m confident that I can be back on the podium this year," Van Avermaet said. "We saw at Gent-Wevelgem how chaotic it is when the race is aggressive from the beginning and this definitely suits me, especially in a race like the Tour of Flanders which is longer and harder anyway. Normally, the race is fairly controlled until we hit the last 100 kilometers or so and then it’s all about positioning, the legs, and a little bit of luck." 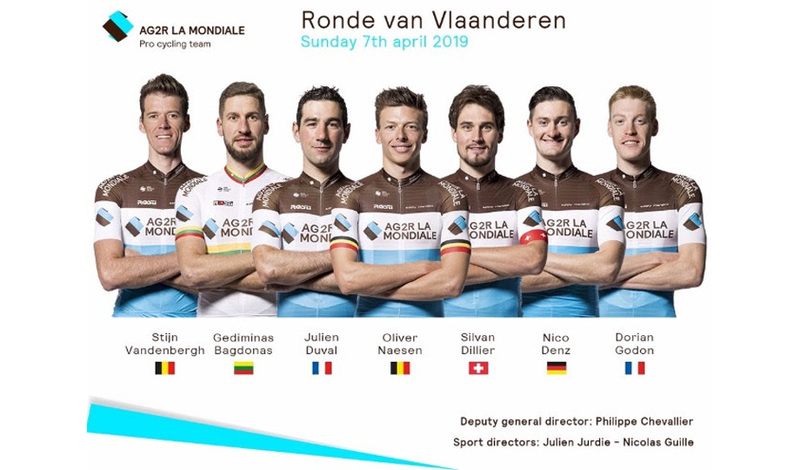 Dorian Godon, 22, will be the only first-timer on the AG2R-La Mondiale team on Sunday at the start of the Ronde Van Vlaanderen. Stijn Vandenbergh: "My condition has been good since the beginning of the classics. But I have been unlucky, which has prevented me from proving it. At E3 BinckBank Classic, I just punctured at exactly the worst moment. I had to use a lot of energy to get back in the pack, and inevitably, I paid for it. At Gent-Wevelgem, I made the mistake of being badly positioned on the Kemmelberg, and that cost me dearly. But still, I cannot wait to be on the starting line Sunday. For a Flandrien, it's the race of the year. Everyone waits for this moment. There are a ton of people on the side of the road to watch it. In order to perform, you have to know the roads very well, because it is important not to waste energy in the first 200 kilometers, since it is the last 50 that prove to be the most decisive." Team Sky may not have a top favorite for Flanders, but the British formation is counting on several strong riders. For example, Dutchman Dylan van Baarle, Luke Rowe and Gianni Moscon are hoping for a big performance in Flanders. That Van Baarle will be at the start of the Tour on Sunday is a small miracle. The 26-year-old Classics rider fell in the Omloop Het Nieuwsblad. After the finish he appeared to have a fracture in his hand. From that moment on it was a race against the clock to still get fit for the other Spring Classics. 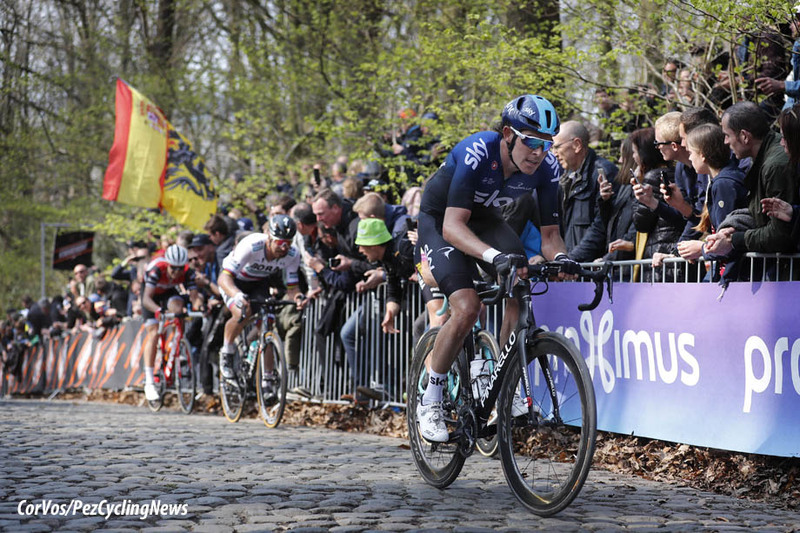 Van Baarle proved fit enough at the end of March to participate in the Settimana Internazionale Coppi e Bartali, taking 6th in the final classification. 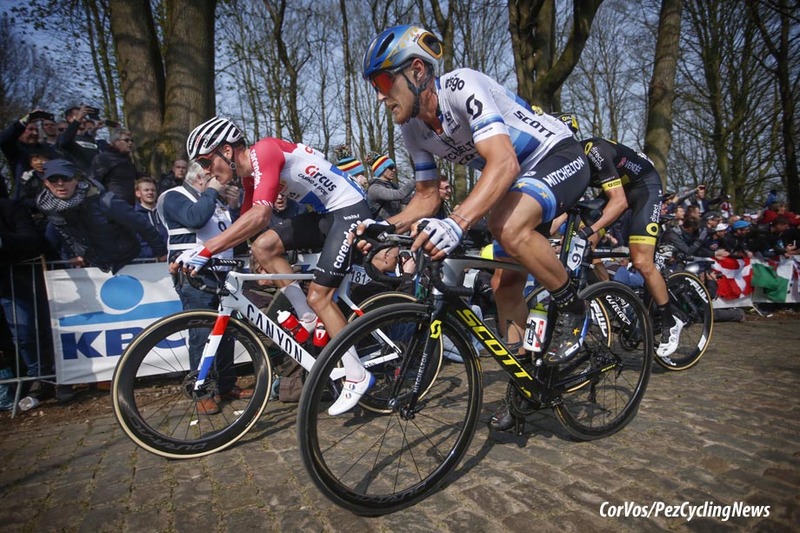 The Dutchman rode Dwars door Vlaanderen last Wednesday. On Sunday he will be joined by man in shape - Rowe. The Brit made an impression in the past races. Team Sky also counts on Owain Doull and Gianni Moscon. Doull was 2nd in Kuurne-Brussels-Kuurne this year. Moscon had a difficult start to the season, but the Italian seemed to get through the last races. Finally, cobblestone eater Ian Stannard, Filippo Ganna and Christian Knees are also selected. Owain Doull (GB), Filippo Ganna (Ita), Christian Knees (Ger), Gianni Moscon (Ita), Luke Rowe (GB), Ian Stannard (GB), Dylan van Baarle (Ned). Jasper Stuyven: "For myself I think I am more in the underdog position at the moment. I didn’t have the same feeling as last year in the previous races, so that’s not ideal but I think I am strong enough to be up there. With the team we will have at the start, we can definitely get what we are aiming for and how we raced last Sunday, that’s the way we have to go out there again. We showed in Gent-Wevelgem that we were there in the final and John could stay easy in the group and Mads (Pedersen) and I attacked, and I think we never let Deceuninck-Quick-Step take full control. I think this is what we can also do in other races and it’s what we had in mind coming to these races, to begin with." John Degenkolb: "The plan for the upcoming races is indeed to tackle them in a similar way (as in Gent-Wevelgem): race aggressively, race together, use our strength. We have done our homework, put in a lot of dedication this Winter and now we just need to put it out on the road." Mads Pedersen: "It’s nice and exciting to be at the start line again after finishing 2nd last year. We have to show something now. As John just said, we did a good race last Sunday and we have to show it again next Sunday. The confidence could be higher, but I truly still believe we can do something good." John Degenkolb: "The ideal scenario would be that we are still at least two guys up there on the final ascent of the Kwaremont because then you still have multiple cards to play. If you race in a smart way, you can support each other in a good way to save energy, but that being said I think we will definitely have to sacrifice some guys to be up there at the key moments. 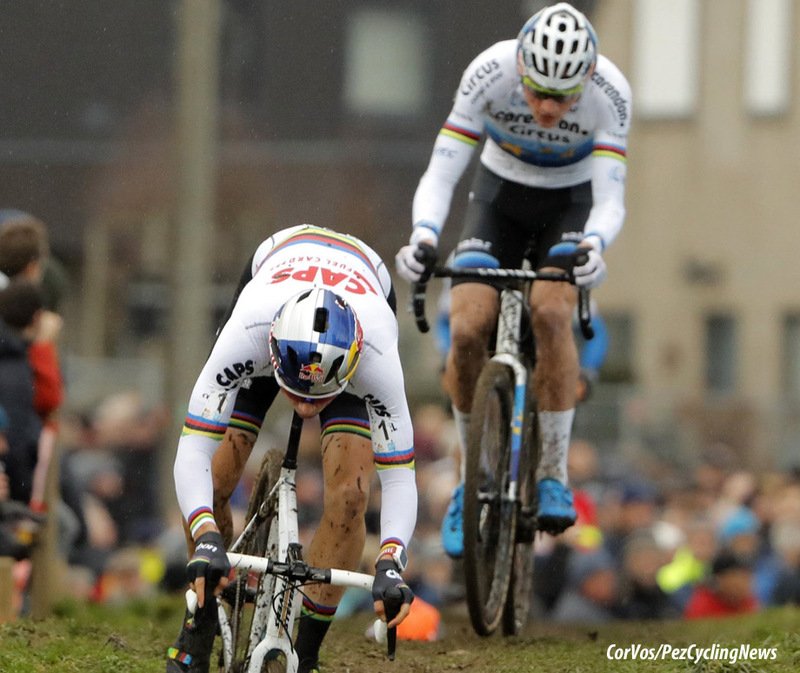 Flanders is all about positioning and if in those key moments you don’t have anyone to make the positioning for you, it will cost you a lot of energy. At a certain point every team, us included, will have to make choices and decide in which direction to go and who will be the guy who spends the least energy to have something left for the last part of the race. Who that guy will be for us, has not been decided yet and it is not my call to make. I definitely want to help the team to perform as well as possible. In the end, you never know what can happen in this race. Look at last year, nobody had expected Mads to be up there, but he finishes on the podium. That’s what makes Flanders so special, really anything can happen." On his preparations for this Classics campaign, Jasper Stuyven: "What I did different as compared to last year was that I got sick (laughs). That’s obviously not the ideal preparation but we will see after the Classics if it turned out well in the end. It’s not that I wanted to peak to one particular race. The Classics is all about this period of 3 weeks where you want to be as good as possible and where you are hoping for a little bit of luck and for that super day on a race day instead of on one of the rest days in between." Trek-Segafredo Men: Jasper Stuyven (BEL), John Degenkolb (GER), Mads Pedersen (DEN), Koen de Kort (NED), Alex Kirsch (LUX), Kiel Reijnen (USA), Edward Theuns (BEL). Sep Vanmarcke is part of the seven riders of EF Education First for the Tour of Flanders. His participation was in doubt after a fall in the E3 BinckBank Classic, but the 30-year-old rider was given the green light. Although Vanmarcke is still working hard to get ready for Sunday, the rider and team confirmed his participation in the Tour of Flanders. "You prepare so well in the winter months for this one moment, for these competitions. And then in your first major race you go flat. It can be so frustrating," he said in a press release. Andreas Klier is optimistic and hopes that Vanmarcke's injuries have improved by Sunday. Apart from the injury, the German is satisfied with the performance of his riders. "I feel that every rider is hungry for the flowers and the main prizes," he says. "From the rider who does his work at the start of the day to the finisher: everyone is just as hungry." In addition to Vanmarcke, the Dutchman Sebastian Langeveld is also part of the selection. Alberto Bettiol, Matti Breschel, Sacha Modolo, Taylor Phinney and Tom Scully complete the team. Alberto Bettiol (Ita), Matti Breschel (Den), Sacha Modolo (Ita), Sebastian Langeveld (Ned), Sep Vanmarcke (Bel), Taylor Phinney (US), Tom Scully (NZ). Terpstra for Second Flanders Win? Can Niki Terpstra win the Tour of Flanders for the second year in a row? The 34-year-old Dutchman hopes to repay his new team; Direct Energy. The French ProConti team is also counting on strong riders like Lilian Calmejane and Adrien Petit. "I think I have a very strong team, especially for Paris-Roubaix," Terpstra said. "We rode very well in Ghent-Wevelgem. This also increases trust. I hope they will do well in the top classics." Terpstra will receive support from Petit and Anthony Turgis. Petit sprinted to 6th place in Gent-Wevelgem, while the young Turgis finished 2nd in Dwars door Vlaanderen. With fellow Dutchman Pim Ligthart and Damien Gaudin, Terpstra has two more experienced riders. Lilian Calmejane rides his first Tour of Flanders, he rode the E3 BinckBank Classic and Dwars door Vlaanderen this spring. Alexandre Pichot fils the final spot. Lilian Calmejane (Fra), Damien Gaudin (Fra), Pim Ligthart (Ned), Adrien Petit (Fra), Alexandre Pichot (Fra), Anthony Turgis (Fra), Niki Terpstra (Ned). Mitchelton-Scott is ready for the Tour of Flanders. The Australian WorldTour team is counting on European champion Matteo Trentin. The Italian receives support from, among others, Michael Hepburn and man in form Jack Bauer. The 29-year-old Trentin has been in excellent shape in recent weeks. He finished in Milan-San Remo, the E3 BinckBank Classic and Gent-Wevelgem in the top ten. "The form is good," he confirmed. "I have recovered well from a demanding Ghent-Wevelgem." "I was in the lead every race, but I lacked happiness. I hope to have some luck next Sunday. The most important thing is that I have a good day," said Trentin. He will probably be able to count on Jack Bauer in the final, who made a good impression in Ghent-Wevelgem and Dwars door Vlaanderen. Mitchelton-Scott has also selected two young riders with Edoardo Affini and Robert Stannard. The selection is supplemented by Michael Hepburn, Christopher Juul-Jensen and Luka Mezgec. "Everyone has faith in Matteo," said team leader Laurenzo Lapage. "He's our man for Sunday." Edoardo Affini (Ita), Jack Bauer (NZ), Michael Hepburn (Aust), Christopher Juul-Jensen (Den), Luka Mezgec (Slo), Robert Stannard (Aust), Matteo Trentin (Ita). Astana has no big names riders on the start-line in Flanders, but will have hopes for outsiders Magnus Cort and Davide Ballerini. 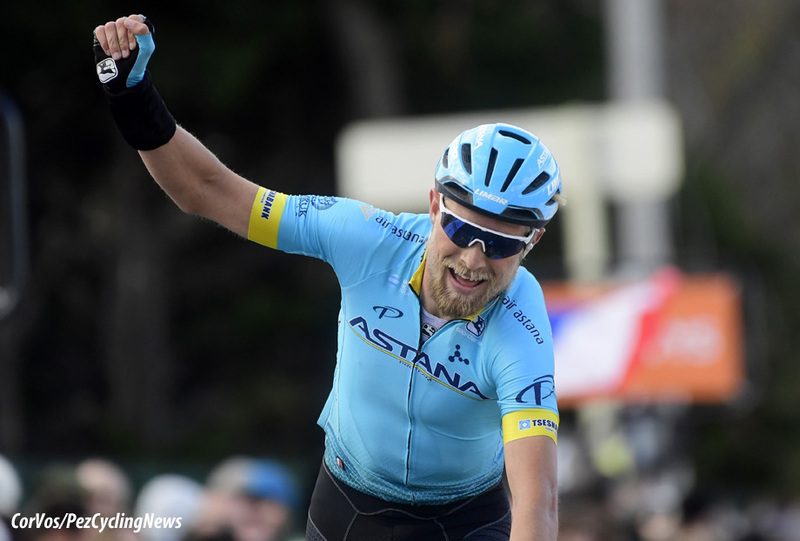 Astana has already won nine stage races this season, but there is little chance that the team will triumph in the Tour of Flanders on Sunday. Cort and Ballerini might just come up with a good result. The Dane has already won a stage in Paris-Nice this season, but he has not yet managed to break through in the classics. Ballerini made a strong impression in Kuurne-Brussels-Kuurne. Last Wednesday he was 7th in Dwars door Vlaanderen. Laurens De Vreese, Yevgeniy Gidich, Zhandos Bizhigitov, Daniil Fominykh and Hugo Houle have also been selected. Davide Ballerini (Ita), Magnus Cort (Den), Zhandos Bizhigitov (Kaz), Daniil Fominykh (Kaz), Yevgeniy Gidich (Kaz), Hugo Houle (Can), Laurens De Vreese (Bel). 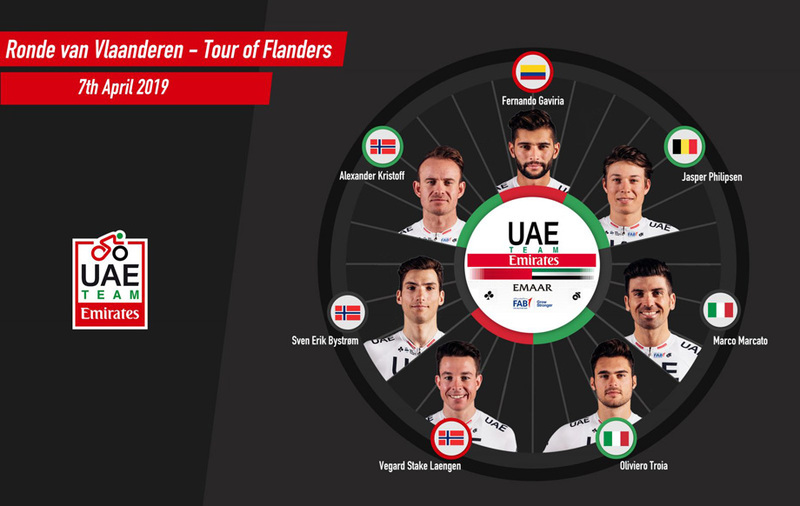 The 103rd edition of the Tour of Flanders sees Edvald Boasson Hagen and Michael Valgren lead our team on one of the cycling calendar’s biggest days. The iconic race, over 270km from Antwerp to Oudenaarde, will once again draw massive crowds along the route with Niki Terpstra being the defending champion. Our experienced selection also includes the only Belgian in our rider roster, Julien Vermote, alongside Reinardt Janse van Rensburg, Jay Thomson, Bernie Eisel and Lars Bak. The latter duo have competed in the race a combined total of 25 times in their respective careers. “At the Classics, when you’re at the top you’re at the top and when you’re not there, well then you’re nowhere. This is where we’ve been struggling at the moment but there are great signs of better form and that’s really good already. Our focus is definitely on Eddy with probably Michael and Reinie to have a bit of an outsider role. 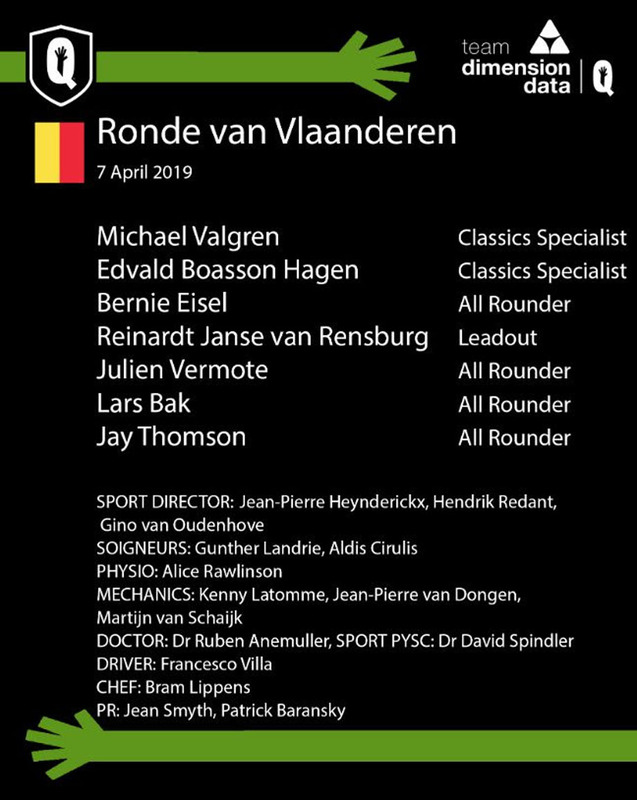 Eddy will be the captain but we can’t expect miracles of them because you can’t hide here and the best riders will be up there, especially as it’s Flanders. “It’s pretty much just a training ride until you hit the first cobbles or crunch-point of the race, you already have 150km in your legs and normally at other races you’re going into the final at that point but here you still have 110km to go and all the major climbs are waiting for you. It’s going to be about positioning, finding the right moment for us to be in the right group and not waiting. That’s the point for the helpers on the day, to get the guys to around the 180km mark without them spending energy up to that point, and get them safely through. “From there it’s pretty much the tactics and the legs that will do the talking for the outcome. 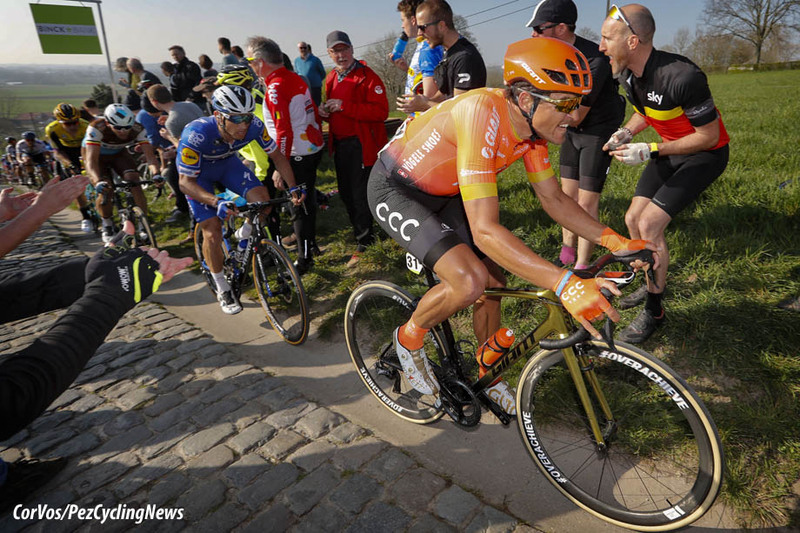 It’s time to show something too – we can’t talk about races still to come – the Vlaanderen classics are all but over with just two races after this and we better do something! “The spirit is good, the weather is good and crazy Belgium is ready for the Ronde and there are already thousands of riders on the road ahead of the sportive – bring on Sunday!” – Bernie Eisel. 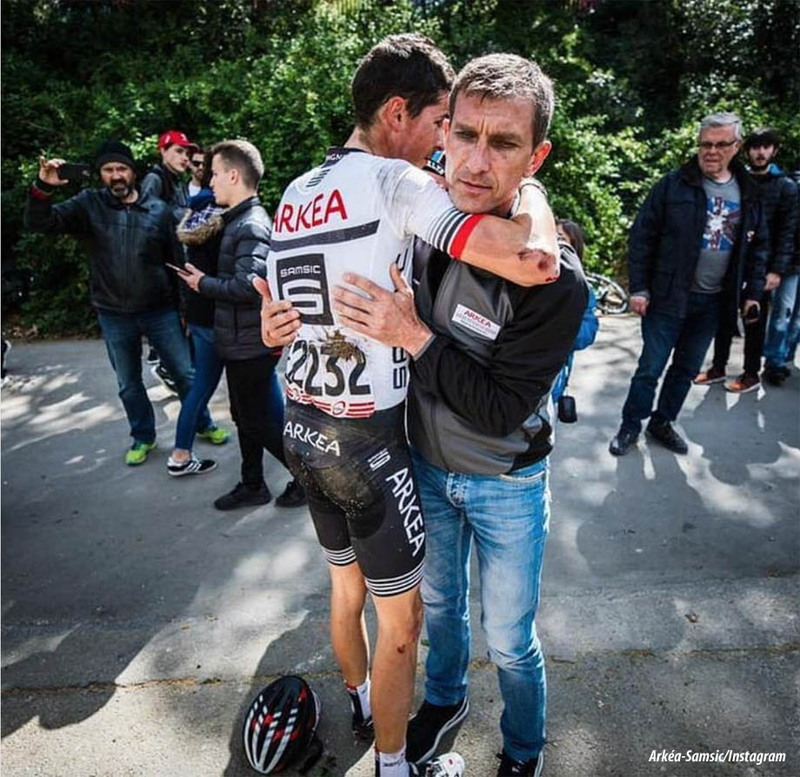 It seemed that Warren Barguil was just shaken by the massive crash in the final stage of the Tour of Catalunya, but nothing could be further from the truth. Further investigation has shown that the French climber has broken his pelvis, according to the Arkéa-Samsic team. According to team doctor Jean-Jacques Menuet, this is a small, non-displaced fracture on the upper part of the iliac bone. Barguil is prescribed a complete rest by the doctors for at least two weeks. When the 27-year-old Frenchman can resume training depending on how the healing process proceeds. Barguil spoke about his crash on social media: "At the same time, I also realize that there are worse things in life. I thank my wife, my family and my fans for the support. I will patiently await my recovery and then start training again." It is not the first time this year that Barguil is on the injury list. In Paris-Nice the former winner of the mountain classification of the Tour de France fell heavily in the second stage to Bellegarde. For a moment there was fear of a broken cervical vertebra, but he appeared to "only" suffer from a whiplash. 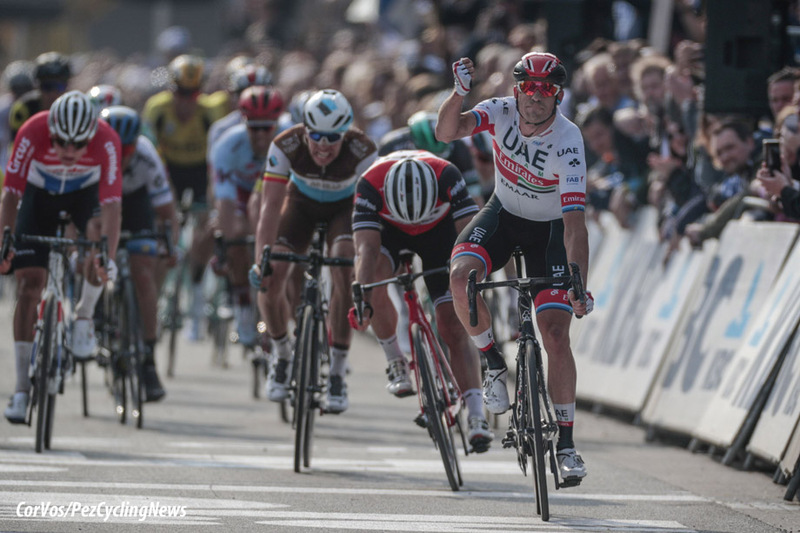 Deceuninck - Quick-Step team boss, Patrick Lefevere, could not express anything but praise for the performance of the two cyclocross riders - Wout Van Aert and Mathieu van der Poel so far in the Classics. When asked, on the talk program Vive le Vélo, which one of the two riders he would sign for his team... he said he would go for Van der Poel. "I think Mathieu is even more of a winner than Wout. Wout will hopefully also win very good races, but Mathieu is more of a killer," Lefevere explained. "I also had his father in the team", referring to Adrie van der Poel. "When Mathieu was barely ten years old, Adrie said to me: 'You haven't seen the last of that little one yet.'" His choice of Van der Poel does not mean that Van Aert would not be on the Deceuninck - Quick-Step team shopping list. "I spoke to him privately, but I told him that we can only really talk when he is free. I don't want any misery with that contract." Lefevere refers to the ongoing contract problem between Van Aert and Nick Nuyens. "As it looks now, he has made a good choice with Jumbo-Visma. That team is very strong in-depth and they are taking part in the race with us. Of course we do not yet know what the outcome of that court case will be." The Australian state of South Australia gave Lance Armstrong nearly a million euros if he made his comeback in the 2009 Tour Down Under, to give the race more prestige. Armstrong retired at the end of the 2005 season, but made his comeback in the Tour Down Under after three years, riding for the Astana team. According to the current finance minister, Armstrong received 1.5 million Australian dollars to be on the start line. Due to a ten year confidentiality clause, nothing could be said about the financial contract. "Lance's appearance in the Tour Down Under came at a time when he was considered the world's greatest cyclist," said Leon Bignell, Australian Sports Minister, before Armstrong's doping confession. "He made sure everyone was watching South Australia when he was driving here, taking the race to a whole new level. The state government has continued to use this method and has ensured that the number of visitors continued to increase, even after the last participation of Lance." Colombian Esteban Chaves will be at the start of this years Giro riding for his Mitchelton-Scott team. 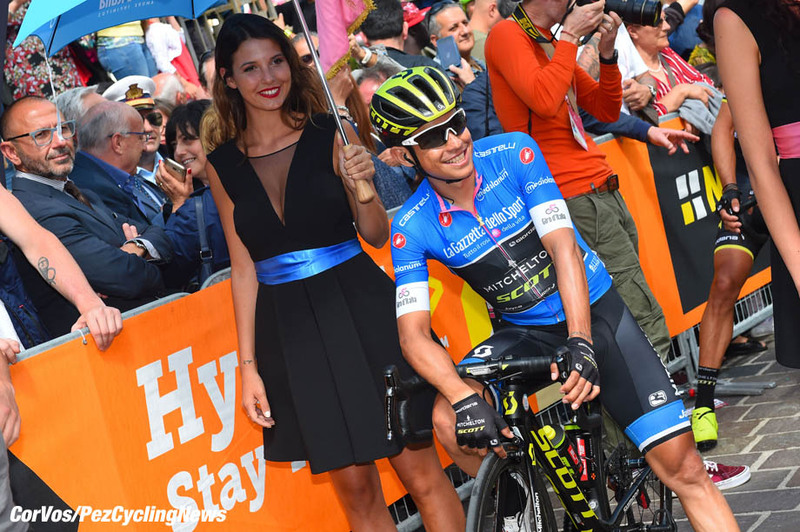 The Australian team announced that the Colombian will be in the Italian stage race to help leader, Simon Yates. In last year's Tour of Italy, Chaves won the stage to Etna, but illness ruined the rest of his race. 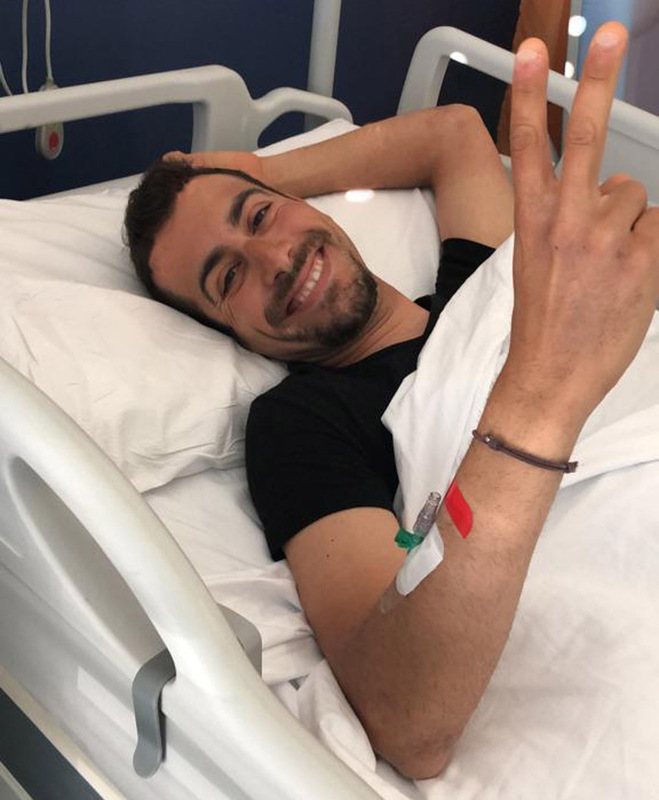 He did finish the 2018 Giro but due to Pfeiffer's disease he was sidelined for months. Only in February did he make his comeback. "I have a special bond with Italy," Chaves said. "Last year the Tour of Italy had ups and downs for us. I am looking forward to heading there again, but I also cannot deny that I have sometimes panicked. I couldn't do much about what happened last year. When after many months I could finally train again, I was afraid it could come back." "Fortunately I have people and this team around me who support me 100%. There were many question marks before the season, but now I feel a lot better, I took steps every race day. I am on my way to being at the start of the Giro in good shape without any health problems." Chaves has already completed four stage races this year. He started his road season in the Tour of Valencia, followed by the Ruta del Sol, Paris-Nice and the Volta a Catalunya. Chaves will rest before the start of the Giro. 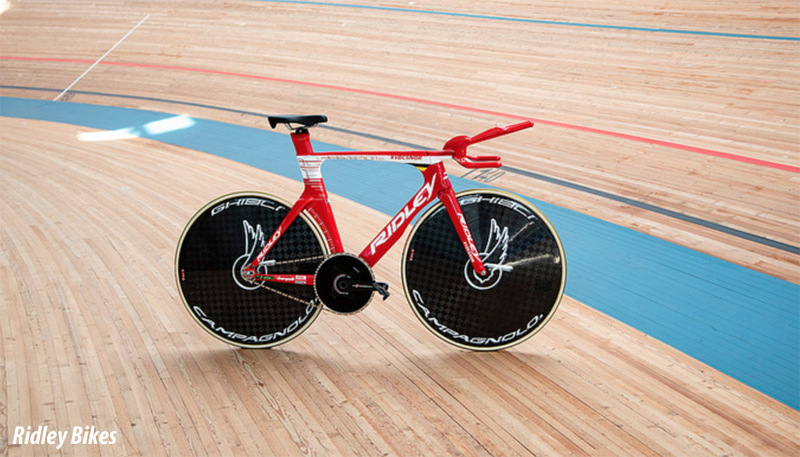 The Tour of Italy starts on May 11th with a time trial in Bologna. 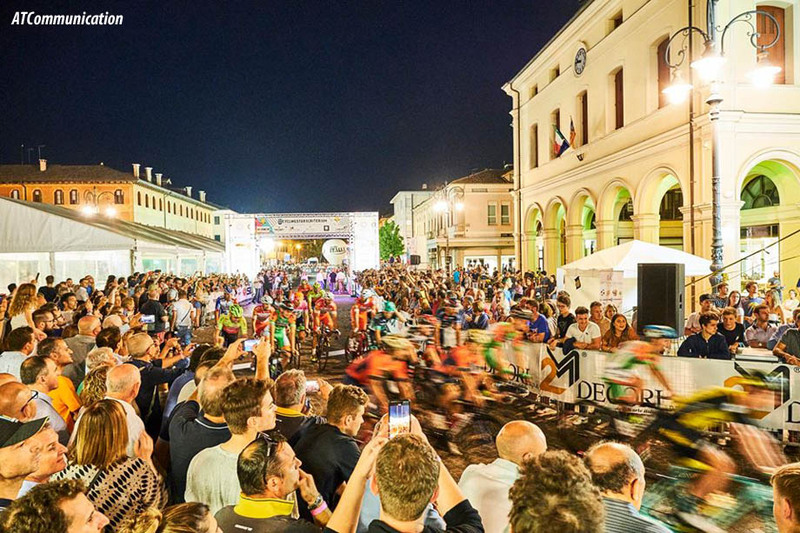 3rd edition of Cycling Stars Criterium, the kermesse post Giro d’Italia will be in Belluno on Monday the 3rd of June 2019. Confirmed to be at the start will be Vincenzo Nibali (winner 2017) and Elia Viviani (winner 2018) and others top riders from the Giro d'Italia. 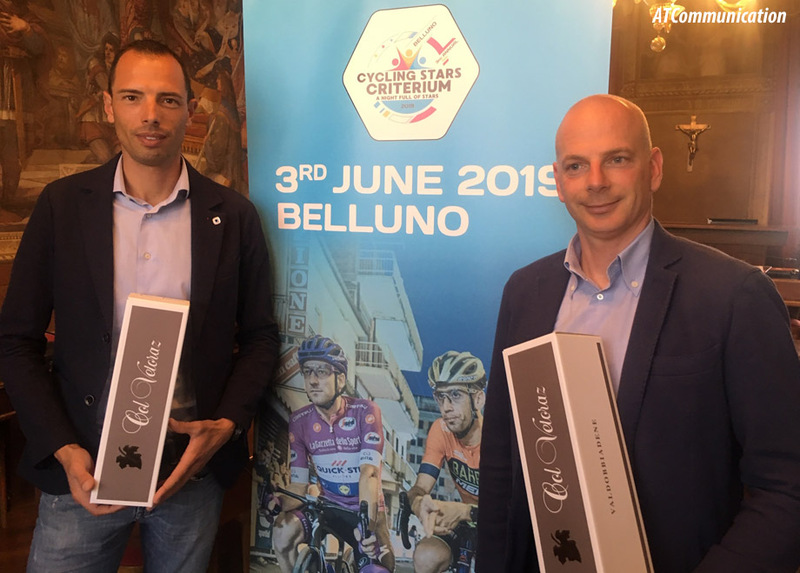 The event presented yesterday in Comune a Belluno in the presence of Alessandro Ballan (World Champion in 2008 and the last Italian rider to win the Ronde van Vlaanderen) and Alex Turrin (the last rider from Belluno to participated at the Giro in 2018). Besides a historic and scenic route, the four stages were designed to suit every type of rider. From sprint stages to more demanding days, the varied terrain in the middle of Germany will be featured. Former pro rider Fabian Wegmann, Sport Director of the Tour of Germany: "After our successful premiere last year, we absolutely wanted to design again four classic stages. The course this year favors both sprinters and aggressive punchers, which will keep the race open to the last meter. This promises an exciting Deutschland Tour." The first stage leads from the capital of Lower Saxony, Hannover, to the Harz region in Saxony-Anhalt. Despite short climbs in and around the Harz Mountain range, the profiled stage over 185 kilometers, offers a good opportunity for the sprinters. The second stage runs between Marburg in Hesse and Göttingen. With 199 kilometers, it is the longest day of this year's race. After a ride through the undulating middle of Germany, a challenging finish loop rewards a late attack. The third stage leads from Göttingen over 177 kilometers to Eisenach. The finale includes three climbs on the last 40 kilometers and will attract the punchers. Eisenach will also host the start of the final stage. The way to the Thuringian capital Erfurt will see a fight between the classic specialists and sprinters. Although only 160 kilometers long but peppered with the ascents of the Thuringian Forest and an uphill finish, the stage and thus the tour remain exciting until the last finish line. Jean-Etienne Amaury, President of A.S.O. : "The Deutschland Tour is a complete success. Right from the beginning it was broadcasted live for four days on German television and impressive images went from Germany to 190 countries around the world. The atmosphere among fans along the course and in the host cities was phenomenal. When the Tour de France winner is just as thrilled as the young German talents, then it proves the great importance of the Tour of Germany for cycling. We look forward to the second edition of this very modern event that goes far beyond a traditional cycling race." Claude Rach, Managing Director of the Gesellschaft zur Förderung des Radsports, the German subsidiary of the A.S.O. : "With Thuringia, Lower Saxony and Saxony-Anhalt, the Deutschland visits three new federal states this year. Regions where we will once again see Germany's biggest stadium at the end of August. Because the Deutschland Tour is our commitment to inspire fans and spectators as well as the 25 million Germans who cycle every week." Ø The second edition of the revived Deutschland Tour will lead over 721 kilometers through the heart of Germany. 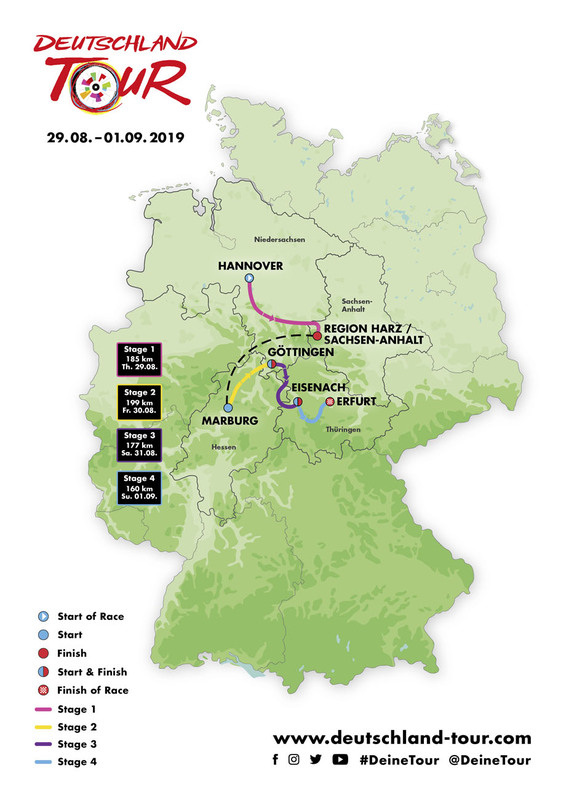 From August 29 to September 1, Germany's only stage race of the men's elite will visit the German federal states of Lower Saxonia, Saxony-Anhalt, Hesse and Thuringia. Ø In the year of the 30th anniversary of the fall of the Berlin Wall, the course pays tribute to the opening of the inner German border with several crossings of the former frontier strip. Both German public channels, ARD and ZDF, will broadcast live from the four days. The leading Italian Cooperative Banking Group deepens and refreshes its long-term relationship with the popular euro regional cycling event. The new logo of Cassa Centrale Banca - Credito Cooperativo Italiano will be on the green jersey worn by the KOM classification leader. "The relationship with Cassa Centrale Banca" - Giacomo Santini, the President of GS Alto Garda, Tour of the Alps’ organizing company, explained - "is rooted in our history as it has been developing during 40 years of Giro del Trentino. Today, the event has achieved even more visibility and we are pleased that “our” bank is a leading actor in its market also through its commitment in this event." A day of fun, fast and free cycling activities will be held in Durham on Saturday 18 May, culminating in elite women’s and men’s races around the series’ grueling and iconic 1.4-kilometer (0.9-mile) circuit. Taking place in the shadow of the city’s cathedral, the challenging cobbled climb of South Street has become synonymous with thrilling racing and a party atmosphere. "Fans love it, locals love it and the riders do, too, so I’m thrilled to announce the OVO Energy Tour Series’ return to Durham in May," said race director Mick Bennett. "The technical and physical challenges that the circuit offers, combined with the town’s stunning, historic backdrop, makes this a round we all look forward to. "No other town or city has hosted the OVO Energy Tour Series more times than Durham; we are ever grateful for the support we have received from Durham County Council since 2010." Cllr Simon Henig, Leader of Durham County Council, added: "We are delighted to welcome the Tour Series back to Durham. It not only offers fantastic entertainment for all of the family but contributes hundreds of thousands of pounds to the county’s economy and promotes Durham to an international audience." 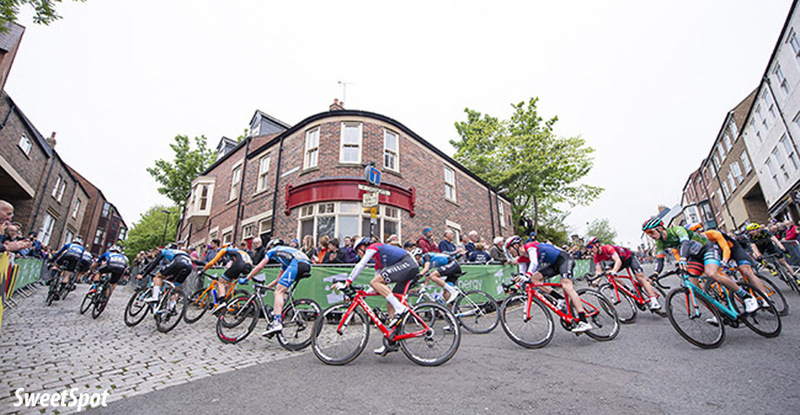 Cllr Ossie Johnson, Cabinet member for culture, leisure and rural issues, said: "Events like the Tour Series are what #Durham19 is all about; creating unforgettable experiences for our communities and showcasing County Durham as the place to be in 2019 and beyond." As announced at Team Sunweb’s Cobblestone Classics Press Meeting at Renson’s HQ earlier today, Team Sunweb are delighted to renew their contract with the talented Dane, Søren Kragh Andersen. Already in contract until the end of the 2020 season, the new agreement will see Kragh Andersen wear the team’s colors until the end of 2022.